This class is for beginners through intermediate metal workers. 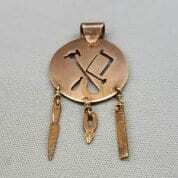 Learn or enhance your ability to manipulate metals by sawing, filing, and riveting metal to form a pendant. Your skill level will determine the detail of your pendant. No experience needed. Instructor: Kelly Kinser. Registration is $128 and includes all materials, instruction, and use of studio and tools. Register in person, via phone at 319 338-1566, or on-line.